Hank (Michael Cera), a scrappy dreamer of a dog, wanting to become a samurai, arrives in a strange land entirely inhabited by cats. Hank, who is a good dog, meets a very bad cat, the nefarious warlord Ika Chu (Ricky Gervais). Ika hustles an unwitting Hank into becoming the samurai for the town of Kakamucho where Hank meets Jimbo (Samuel L. Jackson), a once great samurai who reluctantly takes Hank under his wing and teaches him what being a samurai really means. 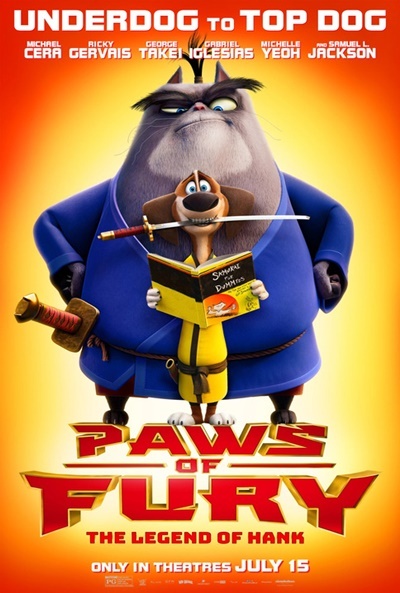 Forging the first real friendship between a cat and a dog, the two set off on a wild and hilarious journey to save the town of Kakamucho from the evil Ika Chu…and ultimately Hank learns what it means to become a true samurai. Read more on Wikipedia.